Professor James E. Bowman died 2011, was an American physician renowned for his specialities in pathology, hematology, and genetics. Bowman is currently professor emeritus in Pathology and Medicine at the University of Chicago Medical School. He is married to Barbara Taylor Bowman and is the father of Valerie B. Jarrett. Geneticist, medical professor and pathologist Dr. James Bowman was born on February 5, 1923 in Washington, D.C. to James E. Bowman, a dentist and Dorothy Bowman, a homemaker. Bowman graduated with honors from Dunbar High School in 1939 and went on to study biology at Howard University where he earned his bachelor's degree in 1943. By attending medical school as part of the U.S. Army Medical Corps at Howard University, Bowman was able to obtain his medical degree in 1946. His intention was to become an Army medical officer, but at the time, segregation prevented it, so Bowman continued his studies in pathology. After an internship at Freedmen's Hospital in Washington, D.C., Bowman did his residency in pathology at St. Luke's Hospital in Chicago from 1947 to 1952. In 1955, Bowman accepted a position in Iran where he studied favism, a disease which relates to the deficiency of glucose-6-dehydrogenase. From 1961 to 1962, Bowman studied genetics at the Galton Laboratory at the University College London. After returning from London, University of Chicago professor Alf Alving invited Bowman to take a faculty position there in the malaria research unit. His research on enzyme deficiency at the University of Chicago sent him abroad to do population studies. Bowman traveled to Mexico, Ghana, Nigeria, Ethiopia and Uganda among other places. From 1981 to 1982, Bowman studied under the Henry J. Kaiser Senior Fellowship at the Center for Advanced Study in the Behavioral Sciences at Stanford University. 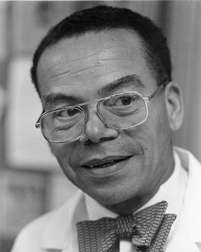 An expert in the fields of pathology and genetics and professor emeritus in the departments of pathology and medicine at the University of Chicago, Bowman also served on the Committee on Genetics; the Committee on African and African American Studies; and as a senior scholar for the MacLean Center for Clinical Medical Ethics. He also published more than ninety works in the fields of general human genetics; hematological population genetics; genetic variation among diverse peoples; and ethical, legal and public policy issues in human genetics. One of his most notable books entitled, "Genetic Variation Disorders in People of African Origin," was co-authored with Robert Barry. Bowman and his wife, Barbara Bowman, raised one daughter, Valerie Jarrett. “It is incumbent upon you to resolve the question which prompted CSC to refer instant case. It is also necessary to determine the degree of association between the applicant and any individual on whom the CSC has furnished derogatory information,” the note said. It apparently was in connect with Bowman’s possible involvement with the “European Recovery Program and was dated 1955. In 1982 James E. Bowman was one of more than 100 Chicago academics, signing an open letter to the voters of Chicago endorsing the mayoral candidacy of Harold Washington. On April 6, 1983, the Hyde Park Herald published an endorsement from the Hyde Park/Kenwood Citizens Committee of Democratic Party Chicago mayoral candidate Harold Washington. Signatories to the endorsement included James Bowman and Barbara Bowman. In 2008, James E. Bowman and Barbara Bowman were listed as sponsors/financial contributors to the Chicago based Business and Professional People for the Public Interest. This page was last modified on 26 June 2015, at 03:27.